In the pious month of Ramadan, the world is witnessing the violent side of a religion which is known as ‘religion of peace’. The violence has transcended the boundaries of nations to manifest itself in Orlando, Turkey, Bangladesh and numerous other such places. When the world was recovering from the shock of Orlando shooting, Turkey felt another tremor of Islamic violence and the recent ones being in Bangladesh and Iraq. The ubiquitous thing about all these terror attacks are the motivation for such act and response of the world leader after the violence. It’s no surprise that Islam is the driving force for these acts of violence in the month of Ramadan as sacrificing himself for the cause of Jihad and killing infidels will yield a better place in the heaven. The liberal media is always careful after the incident to not link it with Islam although the terrorist will chant Allahu Akbar after killing people or declare his allegiance to ISIS publicly. The reporting starts with the mighty phrase ”Terrorism has no religion” and ends with even far mightier phrase “Islam is a religion of peace.” But it’s difficult to conceal the truth for too long. Even if the truth is concealed for a longer time, it won’t ensure that the truth has died. Truth will surface one day for sure. After the terror incidents, the people of world who are not Muslims look at moderate Muslims in the hope that they’ll condemn the act of violence. Another demand from the people is reformation of Islam and it’s also from the people who doesn’t follow the theology of Islam. But there is nothing like moderate Muslims and reformation of Islam is an impossible task for anyone to do. If you analyse the reactions of moderate Muslims after terror attacks, the reactions follow a similar pattern and continuity in thought worldwide. First of all, they distance themselves from the act of terror. The next step will be to call it as ‘hate crime’, ‘act of few misguided people’, or ‘random event of violence’ as there is enormous amount of violence in this world. In reality, all these words are nothing but convenient lies to mislead the world and conceal the truth. Hate is an irrtational feeling which arises in someone’s mind without any profound basis. However, any terrorist attack is not irrational. Terrorists make a conscious choice which is advocated by their scriptures in order to wipe out kafirs/infidels. Their acts have well calculated end results, a religiously sanctioned guideline and a rational choice based on their own morality. Another lie which they tell is labelling them as ‘misguided people’. They’re not misguided at all. They are being guided by the supreme scripture of their religion in the words of Prophet Muhammad who is the perfect human being ever born. The act of terrorism is a political choice with political implications to convert the whole word into land of Allah. Random act of violence has different characteristics than the terror attack. Random criminals neither shout Allahu Akbar nor kill people just because they can’t recite verses from Quran. Thus moderate Muslims are one of the biggest liars who act to conceal the truth from the world. Their next argument is to hypothesize that such crimes are not allowed by Islam. But a simple look at Islamic history suggests completely different narrative. Beginning from the battle of Badr to the recent attack of Bangladesh, it only shows that such crimes are allowed by Islam and its scripture. Qur’an contains more than 100 verses which clearly command to wage war against non believers and either convert or kill them. In the same breath, moderate Muslims try to defend the theology of Islam and profess that Prophet Muhammad never sanctioned all these acts of crimes. This is another blatant lie. The life events and acts of Prophet Muhammad reveal that he was a vile man who always resorted to violence in his entire life. He slaughtered more than 600 Jews after battle of Trench. There are similar countless examples from the life of Muhammad. Now, there arises some serious questions. What’s more important for moderate Muslims? To defend their religion or look for remedies of terrorism? Their reactions only reveal that all they want is that Islam should be free from any kind of blame irrespective of how violent it is. Moderate Muslims don’t want to get labelled as moderate ones. Sarfaraz Manzoor writes in The Guardian in his article, ‘Can we drop the term ‘moderate Muslim’? It’s meaningless’, “This is about more than politeness and semantics. The language matters because if ordinary Muslims feel they are being divided into camps, into “good” (moderates) and “bad” (non-moderates) then any statements made by politicians will be heard with great scepticism, especially if for many Muslims “moderate” has come somehow to mean more secular.” Moderate Muslims try their best to shield Prophet from any kind of attack and always hail him as the most perfect man. If they keep praising such violent person then any change in reality is only a dream. In the Islam, a true Muslim can be only one who follows Qur’an word by word and tries to imitate the Sunnah of Prophet. The moderate Muslims know this fact quite well. Deep down the heart, they know that the people who are carrying the terrorist attacks are doing all the things to be perfect Muslims. According to the theology of Islam, they can’t be questioned. In this dilemma, moderate Muslims also realise that the word ‘moderate’ makes them feel like less religious than the people who don’t call themselves moderate. They don’t want to get labelled as moderate but they’re doing so now because this is best in their interests in current politically correct regime. In such situation, moderate Muslims feel that the word ‘moderate’ is already creating a division among Muslims by labelling half of them as moderate or right ones and other half as wrong ones. To balance out the things in this dilemma, they take the above mentioned approaches to fulfil the aspirations of their own community and liberals of the world who hail them. However, moderate Muslims are well aware about their goals and the goal of Islam. They become happy inside that these terrorist attacks are only helping their religion to expand. And there should be no objection for them. After all, Islam is a military cult who wants to expand its horizon. Around 1400 years of Islamic history is testimony of success of the violent approach. 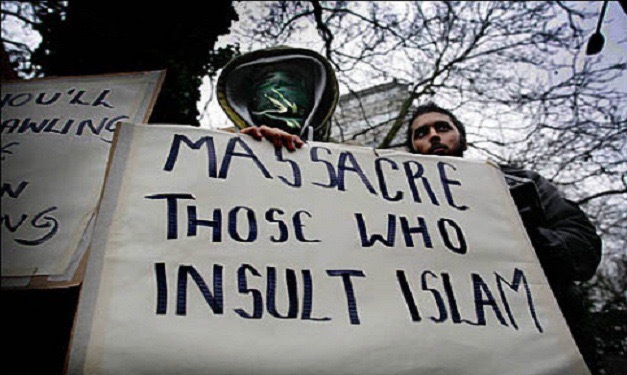 As long as, Islam is gaining success as a military cult, moderate Muslims are less bothered about the methods. The goal of moderate Muslims and extremist Muslims is in sync with each other i.e. expansion of Dar-ul-Harb. The goal of Muslim Brotherhood and ISIS is exactly the same and their methods only differ slightly during the beginning phase. In the later phase, the method of moderate and extremist Muslims to convert the whole world into land of Allah will be same. ISIS reminds moderate Muslims about the glorious time of Caliphate when the larger chunk of Europe, Middle East and Sub Saharan countries were in control of Islam. They have no objection when another person is trying to establish the Caliphate which was uprooted in last century. Moderate Muslims are the ones who are reactive elements but lack the catalyst or favourable conditions to react. Iran is the best example of how quickly moderate Muslims became extremist when they got the catalyst and favourable conditions to react. We will now look at the prospects of reformation in Islam and Qur’an which is the ultimate source of all the violence. Reformation in Qur’an means either erasing the satanic verses from Qur’an or changing it completely. None of these two is permitted by Islam. Allah states in the Qur’an in Surat al-Hajir, verse 9, “Indeed, it is we who sent down the Qur’an and indeed, we will be its guardian.” It means that Allah will protect the Qur’an from any change or error. In another verse, Muhammad says, “How can you improve something which is perfect? You can’t change the Qur’an.” The clue which these two verses give is that it’s impossible to change Qur’an as long as someone has faith in theology of Islam and Prophet. All that Prophet allows Muslims is to reinterpret it. But interpretation and reinterpretation has serious limitations. How will you reinterpret “Slay the unbelievers wherever you find them” in peaceful and non violent way? It’s foolish to think so! The only way to change Qur’an is to get rid of Muhammad and Qur’an. But you can’t do so because you have no authority to do so. You can’t be bigger than Prophet and Qur’an because Muhammad said that he was the last Prophet. As soon as someone tries to challenge this convention, it will be labelled as blasphemous and the reward will be death. The prominent and mainstream Muslims voices confirm that Islam doesn’t need reformation. Mehdi Hasan, presenter of Al-Jazeera English writes in The Guardian, ‘Why Islam doesn’t need reformation’, “The truth is that Islam has already had its own ‘Reformation’ of sorts one line.” Ayaan Hirsi Ali, an atheist who was advocating for reforms in Islam was rebuked by Muslims in hard hitting words. Qur’an is the closed door and you can only bang your head against it. There is not even genuine voices coming from Islam for reformation nor dropping the violent parts of Qur’an. For the sake of argument, to say that violent part of Qur’an should be left out, it has no basis to do so. Someone else will ask that why that part be left out to embrace other part? Which authority sanctioned this? There will be no answer of this. Thus the moderate Muslim is a myth and reformation in Islam or Qur’an is a far fetched dream which will never become reality. This article is written by Satish Verma.